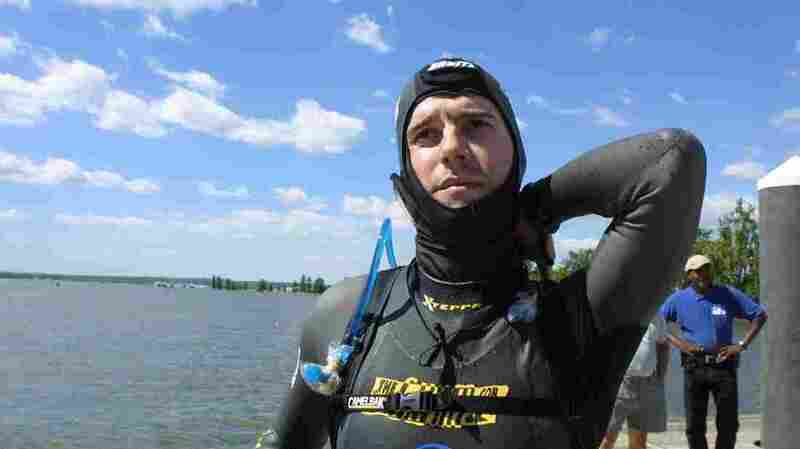 Ben Lecomte Swam Across The Atlantic; Next He Tries The Pacific In 1998, Ben Lecomte swam across the Atlantic Ocean. The 47-year-old athlete is planning another historic plunge — this time swimming across the ocean on the other side of the country. French marathon swimmer Benoit Lecomte (left) prepares to jump into the Potomac River in Washington, D.C., in 2002. In 1998, Lecomte swam across the Atlantic Ocean. In 1998, Ben Lecomte swam across the Atlantic Ocean. The 47-year-old athlete is preparing for another historic plunge: swimming across the ocean on the other side of the country. At the end of September, Lecomte plans to take off from a Tokyo beach and spend the next six months making his way some 5,500 miles across the Pacific Ocean to San Francisco. He'll swim for eight hours a day, then board a support boat to eat and sleep. The next day he'll jump back in the water at the exact same spot. It's physical, it's mental, but you have to have the right mindset. I never jump into the water thinking about the entire ocean, I just cut it into small pieces. When I am in the middle of the ocean, I think about being in a pool and the pool moves with me. What you want to do is have a schedule for your mind. The first hour I'm going to relive a moment that I had with my family, and the second moment I'm going to try to visualize a new place that I have never been to and so on. I had one shark follow me for five days [when I swam across the Atlantic Ocean.] We have different ways to keep sharks at bay, but what is very important is the opportunity to tell a story. We have only about 10 percent of the big fish that are left in the ocean right now, and that happened within the last hundred years, so we have been overfishing the ocean. For me, the swim itself, it's just a way to get the attention on something that affects all of us: sustainability and the environment. If I knew how to sculpt or paint, I think that would be the way I would like to express myself, but I am an awful painter and I don't know how to sculpt. So I stick to swimming.